[LOCAL: NEWS] NewMexicoKidsCAN Launches in New Mexico. One of the few things all New Mexicans agree on is that our public education system needs improvement. NewMexicoKidsCAN exists to provide productive outlets for that sentiment, and to ensure we keep our kids at the center of those conversations. I've been involved as a local advocate and advisor on this work for the past year. So, I'm thrilled to congratulate Amanda Aragon as the founding executive director for what will be a strong voice for what’s possible for the children of New Mexico . - Texting NMKidsCAN to 52886 to receive updates. - Charter school students account for about 15% of our 361,843 students statewide. [LOCAL: NEWS] Self-Important Blogger Goes on TV. Yours truly had the opportunity to join the inimitable Lorene Mills of Report from Santa Fe and the esteemed Fred Nathan of Think New Mexico to rap about education. As always Lorene and Fred are seasoned professionals with great experience in and optimism about the state. I am thankful I was able to add my voice and tag along for the ride. The more New Mexicans who talk about education and how we work together to improve, the better. [LOCAL: NEWS] Pre-K Bill Makes It Out of House Education Committee. In a 7-6 vote along party lines (committee members can be found here) House Joint Resolution 1, better known as the constitutional amendment which would annually divert 1% of the Land Grant Permanent Fund (NMLGPF) to invest in early childhood education, now moves onto House Judiciary and the House floor, where it will likely pass with ease before facing an uphill battle in the Senate. See below for more on the NMLGPF and its current beneficiaries. 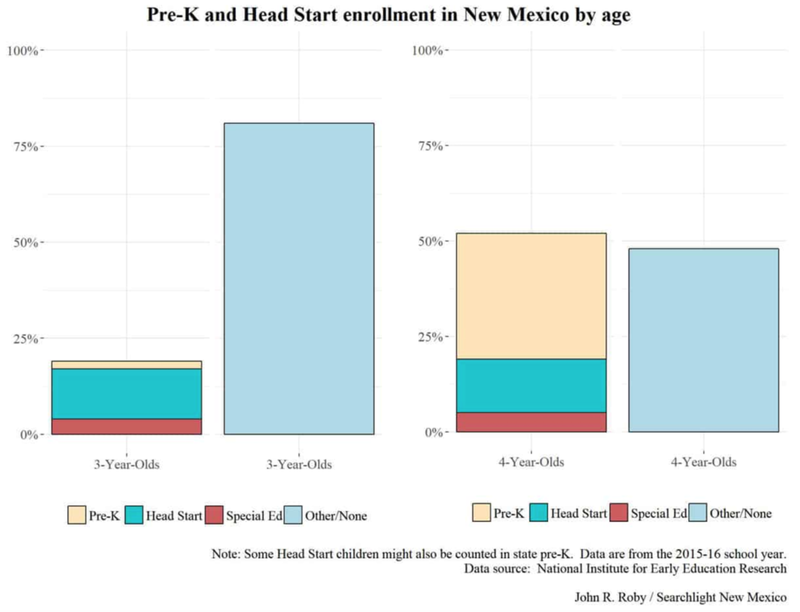 [LOCAL: NEWS] Two Stories Highlight Policy Challenges in NM Pre-K. In some of the best local education reporting I've read, Lauren Villagran of Searchlight New Mexico, digs into the underbelly of New Mexico pre-k. The short story is that "the state is paying to educate more 4-year-olds in private child care centers or elementary schools", which is good. What's not so great is that as a result, due to perverse policies, federal Head Start programs continue to lose hundreds of thousands, and potentially millions, of dollars we can't get back. The worst part? It doesn't have to be this way. In fact, as Lauren brilliantly reports, there are many examples of how states have expanded pre-k without losing Head Start monies and maintaining options from private providers. With HJR01 moving along (see above) we need to get ahead of this thicket sooner than later. [LOCAL: INTERVIEW] Kids Count Data Book Interview. As I wrote about last week, NM Voices for Children recently released their 2017 Kids Count Data Book. Bill Jordan, Senior Policy Advisor & Government Relations Officer, sat down with Megan Kamerick at New Mexico in Focus to talk about how we got where we are, what's working, what isn't, and how we can continue to move forward. Bill's point about how The Great Recession has lingered in New Mexico - and will continue to do so without a shift in our economic makeup and improvements to public ed - is spot on.